(AP) The players on the U.S. women's soccer team had never known a feeling quite like it. They came home as conquering heroes. 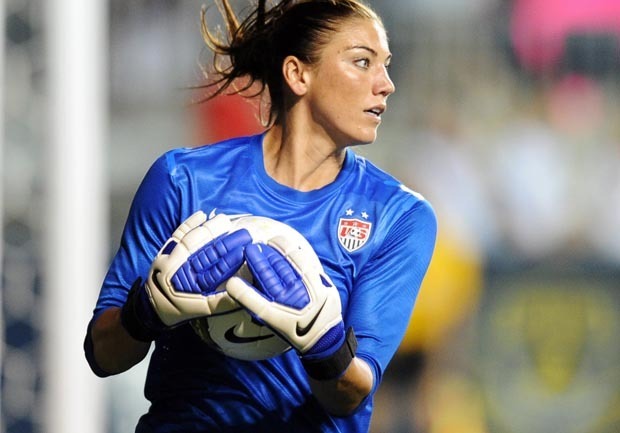 Hope Solo and Abby Wambach kicked balls at taxicabs on Letterman. Celebrities, politicians and newfound fans sang their praises. Even though they had lost. "It was very strange for us to jump on that plane after the final, come to New York City, come to Times Square, and there's mobs of people cheering for us, letting us know how proud they were of us," veteran midfielder Heather O'Reilly said. "It was a very, very, tough, difficult couple of days." This was last summer, after the Americans recaptured the national spotlight with a captivating run at the World Cup in Germany. All was going so well  come-from-behind wins, big plays from familiar faces and new ones, record TV ratings back in the States  until the shootout loss to the team from earthquake-devastated Japan in the championship game. For once, at least in the eyes of the public, there was nothing wrong with second place. For the players, so accustomed to their perch atop the rest of the world, there was no such silver lining. "We were so gutted," O'Reilly said. "We were so disappointed. We saw the sort of reception that we got, and it didn't really correlate with how we felt inside." The World Cup team is now the Olympic team. Seventeen of the 18 players are back for the Summer Games in the latest edition of the great American redemption tour. Gold in London is the one and only way to compensate for runner-up in Frankfurt. "I don't think any of that will ever leave us. That's the flame that got lit," Wambach said. "When you come so close to winning something and just fall short, it's one of those situations where that's what makes the great athletes even greater. You let your failures and you let the things that knocked you down inspire you and push you forward, and I think that's what the Japan game was. "Credit to them. They deserved to win the World Cup. But we're preparing for the London Olympics." The women's soccer calendar allows for such quick make-goods, with the Olympics always coming one year after the World Cup. The Americans have mastered the avenger routine at the last two Summer Games, taking gold in 2004 and 2008 after slip-ups at the World Cups of 2003 and 2007. It's an interesting note that no country  not even the U.S.  has ever won the World Cup-Olympics double. Everyone, therefore, has stayed around for another shot  except defender Ali Krieger, who blew out her right knee in a qualifying match in January. London could be the last go-round for longtime vets such as Heather Mitts, Shannon Boxx, Christie Rampone, O'Reilly and perhaps Wambach. Rampone, the captain, is the last remaining player from the squad that captured the 1999 World Cup at the Rose Bowl, one of the landmark moments in women's sports. The youngsters are eager to send their mentors out in style, the same way Mia Hamm and the other pioneers went out on top in Athens eight years ago. "I think Abby and Christie and Boxxie and those older players are such an important part of this team," defender Rachel Buehler said. "And you do feel like you owe it to them." To get there, they again might have to deal with the Japanese, who have gone about proving that the World Cup was no fluke. Japan beat the U.S. 1-0 at the Algarve Cup in March, the only loss the Americans have suffered this year. The teams also played to a 1-1 draw in Japan in April before the U.S. finally broke through with a 4-1 victory on June 18 at the Volvo Winners Cup in Sweden, a result that restores the Americans as favorites in London. Also, Homare Sawa, the reigning FIFA world player of the year and the heart of the Japanese team, hasn't been in top form since an extended bout of vertigo. "I think that we respect them so much, that it was a little too much," U.S. midfielder Lauren Cheney said after the three-goal win. "I think, going forward, we know can beat them. They were our nemesis in the World Cup and hopefully this will just build our confidence for the Olympics." Even though the rest of the world has closed the gap, the Americans still have by far the deepest, most talented team in the draw. Wambach, 32, is now second all-time to Hamm in career international goals. Her new partner up front is Alex Morgan, who turns 23 on July 2 and has been scoring this year at a rate not seen since Hamm went on one of her many scoring binges in the `90s. Wambach and Morgan make an ideal tandem: old and young, power and speed, veteran savvy and boundless energy. Germany won the Algarve Cup this year and would have been a strong contender for gold, but the Germans were the odd team out because the Europeans didn't hold a qualifying competition  instead sending the two teams that placed highest at the World Cup. One of those teams is Sweden, which has lost 4-0 and 3-1 to the Americans this year. Canada couldn't keep up with the U.S. either, losing 4-0 in a qualifying game that was even more lopsided that the score indicated. The Canadians qualified for London, and they have one of the top players in the world in striker Christine Sinclair, but they don't have the depth to match the American squad. "They've got a different gear," Canada coach John Herdman said. "And when they find it, it's hard to keep with them." Two-time defending Olympic silver medalist Brazil will play with its usual flair, and Britain will have home-turf advantage in its first appearance in the Olympics, a deviation from the tradition that has England, Scotland, Wales and Northern Ireland competing separately as soccer nations. France might be the best team at the Olympics after the U.S. and Japan, but the French are drawn into the same group as the Americans. The U.S.-France game in Glasgow on July 25  two days before the Olympics' opening ceremony  is an early, crucial matchup. A loss to the French, who have a strong attack and finished fourth in the World Cup, would throw the tournament wide open and suppress discussions about American dominance. But the U.S. players will be playing with an emotional edge  the memory of the World Cup loss and the tough-to-stomach reception that followed. This time, when they arrive home, they want everyone celebrating a win. "We're preparing for a situation where we know that the games are going to be close," Wambach said. "That (loss to Japan) will always motivate me for the rest of my career."